CSLoad38 is a simple loader for the Wimodem to use the 38400 baud driver for Commodore Server. It will load a 2400 baud driver (c64-up2400.ser) and set the neccesary settings on the Wimodem. Note: This assumes the wimodem is set to operate at 2400 baud. If this is not the case, you will need to set this baud rate for the above mentioned driver to work. After this it will load the 38400 baud driver (v-1541.38k) , send the connection string (atdt commodoreserver.com:1541) to the Wimodem and then reset the C64. At this point you can SYS 49152 and Load"$",2 as normal. WiReset is a simple program for the Wimodem that will reset it to its default settings without having to power-cycle the machine. 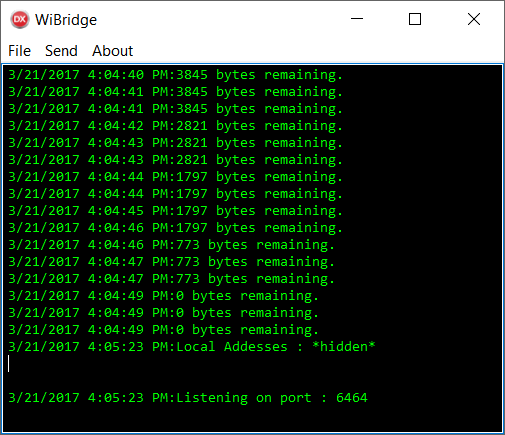 Wibridge is a simple file transfer utility for the Wimodem that allows to to transfer files from a Windows machine (tested on windows 10) to your C64. Run wimodem on your windows machine. It listens on port 6464 so make sure your fiewall doesnt block this on the host machine. Added the ability to browse the pc host using standard DOS commands(DIR,CD <DIRECTORY> etc). WARNING! Please be aware that this is a fully blown dos CMD wrapper so it is possible to delete files on the host if you want to do so. Added the ZGET Command. Type ZGET <FILENAME> to get the file via ZMODEM. Wildcards are supported e.g ZGET *. * will get all files in the current folder. Note that 80 column mode is strongly recommended whine working like this. Note. Be sure that you have enough space on the destination disk, or the transfer will abort. Warning! Download and use at your own risk. All binaries are scanned with Virustotal. I don't charge anything for the software I produce and most likely never will, but if you feel like buying me a beer or a coffee because you found one of my programs useful or fun, there is a paypal donation link in the sidebar.